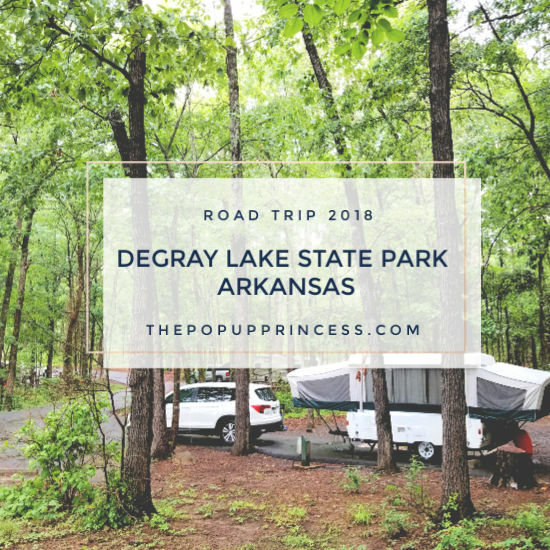 DeGray Lake State Park in Arkansas was the next stop on our epic road trip. If you missed the first two stops on our summer camping vacation, you can catch up here. We originally planned to make our way to Crater of Diamonds State Park. We kicked off the trip with two hotel stays, so we knew we’d be ready to break out the camper and sit around a fire. After much deliberation, we decided to make a quick itinerary change just before we left home. Arkansas was supposed to be HOT, so we wanted to have a water source close. The kids were interested in swimming and paddleboarding, and Mr. TypeTwoFun really needed WIFI so he could work on the road. DeGray Lake offered both of those, so we made the switch. I am actually so glad we did, because we all ended up loving this place. We were pretty excited when we left Texas that morning, as none of us had never been to Arkansas before. 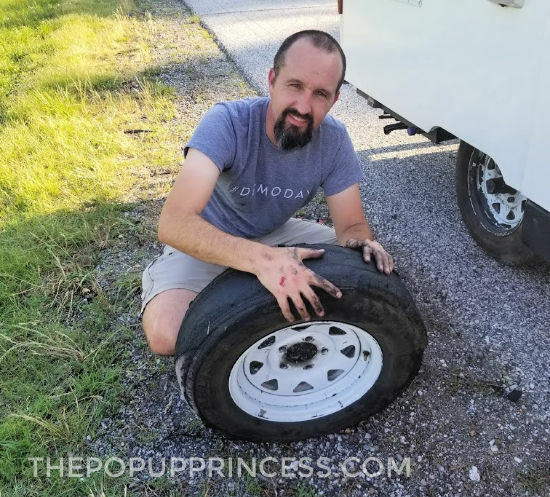 Not long after crossing the state line, we were welcomed in with our very first camper flat tire. Yes, after thousands of miles and four long road trips, we finally joined the club. 😆 Thank you, Arkansas! We were pleasantly surprised at how nice Arkansas drivers are, though. Everyone moved to the outer lane when they passed us, and changing the tire was quick and easy. We were back on the road in no time. 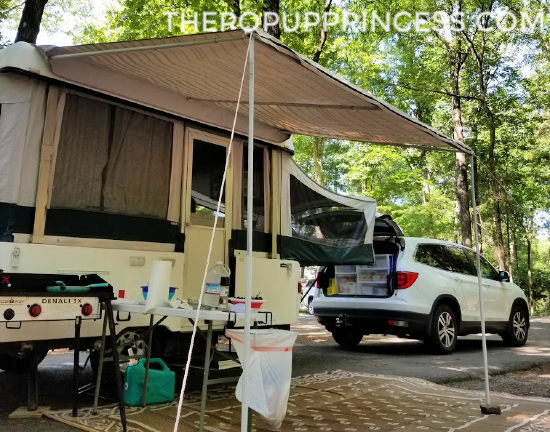 We stayed at the campground within the DeGray Lake Resort State Park. When we booked our reservation online, it was very last minute, so we took one of the only sites available. It wasn’t a great site and nowhere near the water, but we were late to the game. The really prime spots were booked long ago. 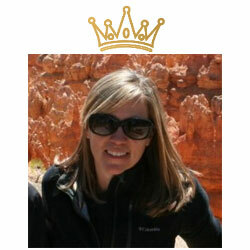 Upon check-in, however, the awesome staff informed us that there had been a late cancellation on a nicer site. They set us up with a gorgeous spot right across from the lake. Score! It ended up being an amazing site, too. Look at that view! 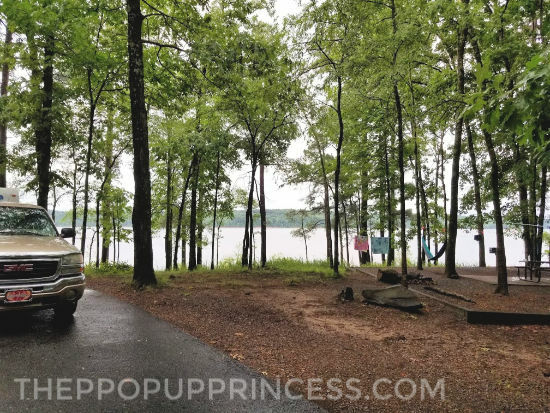 One of our campground neighbors informed us that he stays at DeGray Lake State Park every year, and in order to get a lakeside spot, he has to book a year in advance. We really lucked out! Otherwise, our site ended up being perfect for us. There was more than enough room to spread out our chairs and relax, although it was a little too warm and wet for a fire. We did love the view from our campsite, though, especially in the mornings. We would unzip the bunkend windows, look out over the lake, and wake up to the sounds of the forest. That is definitely my favorite part of owning a pop up camper. We really feel like we are still experiencing nature, and Arkansas is so beautiful and green, there was so much to appreciate. But after the first night, we realized just how hot and muggy this state can get. We got a huge rain storm that evening, and the humidity nearly killed us. 😉 Our little Santa Fe does not have A/C, so we headed up the road (about 30 minutes or so) to Wal-Mart for some small fans to help circulate the air in the camper. Those little fans ended up being lifesavers. Definitely don’t try to do the South in the summer without an A/C or at the very least fans. We learned that the hard way. There is plenty to keep your kids busy at this park. Mr. TypeTwoFun had to work all morning, so he headed off to the lodge to take advantage of the WIFI. While he was working, the kids and I hit the stables. I am just going to say this now… I am not a fan of horses, but my kids (especially the girls) love them. Everywhere we go, they always want to take a trail ride. Usually, I can pawn this off on Mr. TypeTwoFun, but since he was working, I had no way out. The ride was only about an hour long, and it was not the most exciting or beautiful trail ride, but it wasn’t as bad as I had feared. I actually didn’t mind it at all–which is saying a lot for me. The kids said it was a bit boring, especially when compared to their trail ride at Glacier National Park. It was much cheaper, though, so that made the budget happy. It cost us $30/person for an hour long ride, and would be perfect for younger or novice riders. When Mr. TypeTwoFun finished up with work, the kids were ready to do some swimming. Since we had never tried our hands at stand up paddleboarding, we headed to the marina to rent a few boards. This was also a really budget friendly activity. The boards and kayaks were $8/hour and $20/half day. 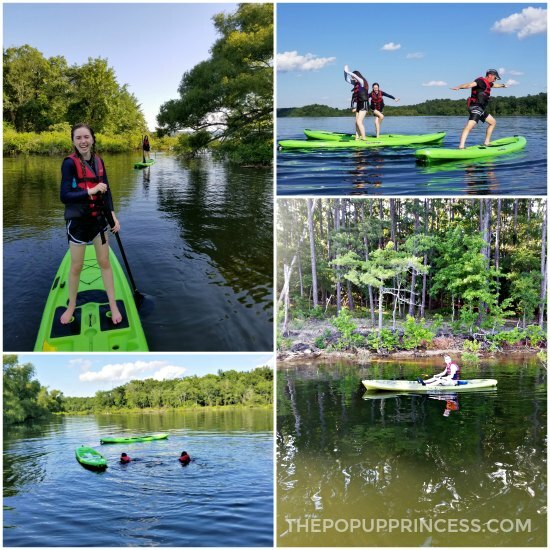 We knew we weren’t going to be professional paddleboarders and would probably tire soon, so we rented the boards for two hours. We actually spent about an hour and a half on the lake. The staff at the marina refunded what we paid for time unused when we returned the boards. So for around $12 a person, we made some amazing memories. As expected, we weren’t great at stand up paddleboarding, but the kids didn’t care. They had a blast pushing each other off their boards and swimming around the lake. 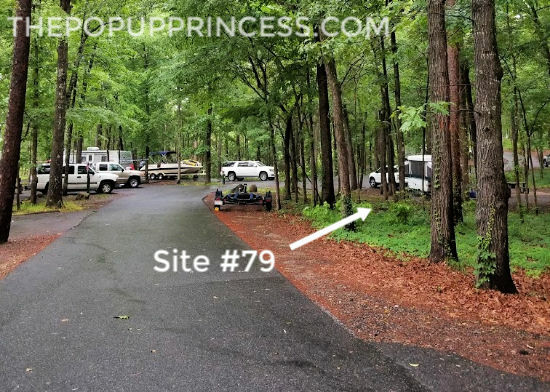 DeGray Lake Resort State Park has 113 campsites with water and electric hookups available. Each site has a fire ring, picnic table, barbeque grill, and lantern hook. There are also bathhouses with hot showers and flush toilets throughout the campground and a dump station on-site. Many of the campsites are situated right on the lake, and are quite lovely, but they book up fast. Make your reservations in advance by visiting the Arkansas State Park website and booking online. There are plenty of fun activities at DeGray Lake Resort to keep everyone in the family happy. There is a beach area specifically for swimming, which we did not visit, but we did hit the marina to rent stand up paddleboards and kayaks. 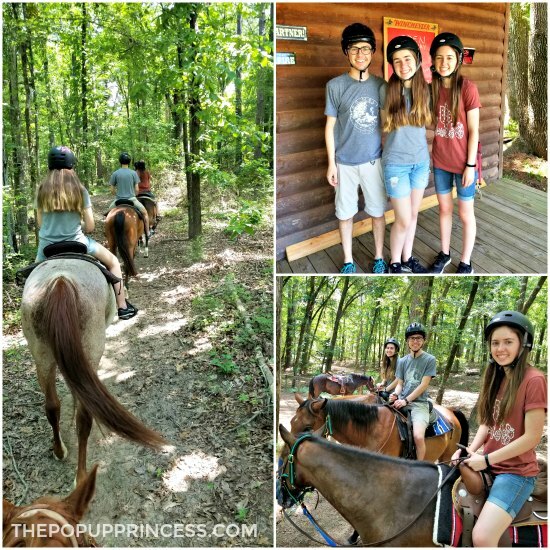 If horseback riding is your jam, be sure to check out the stables. There is a great little one hour trail ride that is perfect for novices. For more information on rates and reservations, check out the DeGray Lake Resort State Park website. 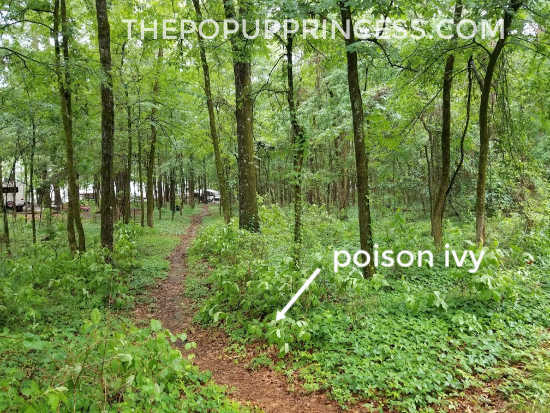 There is quite a bit of poison ivy on the grounds. Make sure your family members know how to identify it and steer clear. We noticed a lot of this nasty plant around the paths to the bathhouses, so be aware. Need WIFI? You can find it at DeGray Lake Lodge. It’s complimentary for campers, and although it wasn’t super fast, it got the job done. The Shoreline Restaurant is also at the lodge, so if you just don’t feel up to cooking, you’ve got options. DeGray Lake Resort was definitely a very family friendly campground. There were lots of camping families enjoying everything the park had to offer. When we were there, the park was well maintained and quiet hours were observed without any issue. We had such a great time, and would definitely recommend this one. We thoroughly enjoyed our introduction to the beautiful state of Arkansas. The people were so nice (Southern Hospitality is real, y’all!) and the scenery was gorgeous. If you find yourself in this amazing state, put DeGray Lake Resort on your list. You won’t regret it! And if you are an Arkansas native, let us know your favorite spots. We only spent a few days here, but we can’t wait to go back! Do you mind me asking what car you have? I have a 2016 Chevy Traverse and it looks really similar. I don’t have a tow package though so the tow weight is very low. 🙁 Something I wish I’d known when I bought it since we are now looking to buy a PUP. We have an AWD Honda Pilot, Chris. I absolutely love it. The towing capacity is right around 5,000 lbs. Arkansas Native here! We love Petit Jean, Mt. Magazine, and Devil’s Den State Parks. All amazing parks with great facilities! Awww! This was so sweet! I am from Arkansas and so proud you were treated well. We have never been to DeGray Lake so I enjoyed your review. Personally just not a fan of that area. Murfreesboro is interesting but we enjoyed the Ron Colemon Crystal Mine and enjoy Hotsprings area. Catherine’s Landing is a nice campground! And Lake Quachita is a beautiful lake. 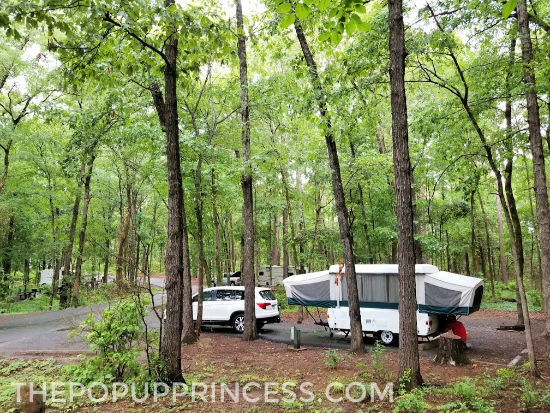 Our favorite is prob Greersferry Lake and most of its campgrounds are nice.